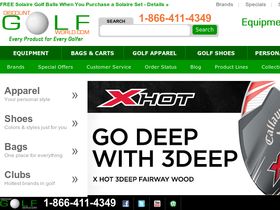 Enjoy golf for less with Discount Golf World, online at DiscountGolfWorld.com. There is nothing Golf, they don't do! No matter what you're searching for, be it equipment, apparel, bags, or shoes, Discount Golf World has your golf needs covered. Search from thousands of products from leading brands like Callaway, TaylorMade, Adidas, Titleist, Cleveland Golf, Puma, and more. They also offer a wide range of golf memorabilia and art work. Hit the greens for less with the best Discount Golf World coupon codes, Discount Golf World promotions, and Discount Golf World savings from RetailSteal.com. Discount Golf World offers free shipping on orders of $99 or more. Expedited shipping options are also available. Discount Golf World offers a 30 Day merchandise exchange policy. Check DiscountGolfWorld.com for full details on shipping and returns. Shop at Discount Golf World today and save up to $100 on Diablo Octane drivers and woods. Shop at Discount Golf World and receive free shipping when you spend $75 or more on your next order. Shop at Discount Golf World today and save up to $75. Get 60% off select gear, apparel and accessories in the outlet online at Discount Golf World. Click link to shop now. Save up to 50% on select name brand close-out golf shoes and bags only at Discount Golf World. Get 5% cash back on any online order when you sign up for Rewards Dollars at Discount Golf World. Click link for savings. At Discount Golf World find golf pants for $39.99 and under. Click to save. Find golf bags for $99 and under at Discount Golf World. Click link and shop. Save 25% off select headcovers with this special offer from 3Balls. Act now and save an extra 15% off golf shoes from 3Balls.com.